This past Sunday, as I worked on the recipe for this week's post, it was SNOWING here in Pittsburgh! WHAAAAAAT?? It's only October! I am not mentally prepared for snow just yet. That said, a chilly, blustery day is the perfect day to bake! See, there is always a silver lining to a yucky weather day. This week's post features another great apple recipe from the latest edition of King Arthur Flour's Sift Magazine - Roasted Apple Bread. I was intrigued when I saw this recipe for a yeast bread which features roasted apples and chopped nuts ( I chose to use pecans.) Roasted Apple Bread falls in the category of a no knead bread which means that you really don't do much if any kneading. Yeast and time do the work of developing the glutens for you. However, this also means that this is not a recipe that you make on the spur of the moment. The dough requires a long slow overnight rise. Out of curiosity, I checked to see if this recipe is posted on KAF's website. I like reading recipes posted on the web because I can read comments about the recipe that other bakers write. I get many good ideas and tips from fellow bakers who have tried the recipe and have taken the time to share their experiences, both good and bad, with others. In fact, I did get some good pointers from other bakers which I will share with you as we make this recipe. Okay, let's get started. For the first step, we need to roast the apples. I love to roast fruits and vegetables before using them in a recipe. The roasting process concentrates the natural flavors in the produce. For my bread today, I am using Mutsu and Stayman Winesap apples. Any time you are using apples in a recipe, it's a good idea to use at least two varieties of apple. Each apple has its own flavor profile which in combination will enhance the apple flavor in your end product. You don't need to peel the apples for this recipe. Just core them and rough chop them. The chopped apples are tossed with cinnamon and sugar and then spread on a lined baking sheet. Roast the apples in a hot (425 degree) oven for about 10 minutes. You don't want the apples to get too soft as they will bake more when the loaf is baked the next day. Cool the roasted apples and store them in the frig until the next day. Next, mix together the ingredients for the dough. All purpose flour, white whole wheat flour, salt, yeast and water are combined in a large bowl. Here, I took the advice of several bakers who suggested substituting Boiled Cider for part of the water in the dough. Boiled Cider is a product made in New England that I discovered a few years ago and it is simply fabulous. I don't know how it is made but it is a dark, syrupy liquid with an intensely apple flavor. It is a staple in my autumn baking. Dough ready for its overnight rest. I combined the dough ingredients in a large bowl and mixed them together. Here's the dough just after mixing. The bowl is covered with plastic wrap and left on the kitchen counter overnight. Nighty night, sweet dough. See you in the morning. Nicely risen dough - ah, the magic of yeast! Whoa!! Check it out! Just look at how much the dough has risen! It is hard to believe that only 1/2 teaspoon of yeast did all of this! I love this stuff! The dough is ready to have the apples and nuts worked in but before I do that, I want to get the baking vessel ready to receive the loaf. I have chosen to bake this bread in my long covered clay baker. This is a great baking vessel as it replicates the characteristics of a brick bread oven which result in a loaf with a delightful chewy crust and a light crumb. 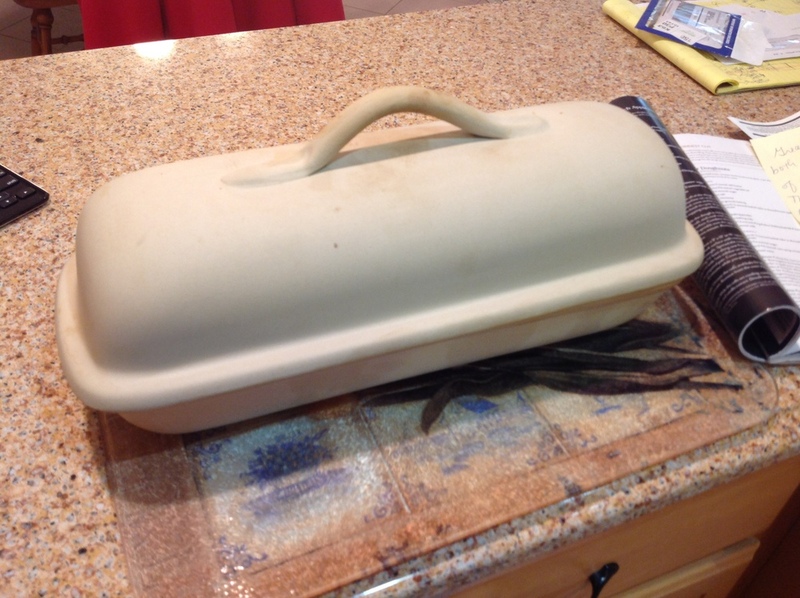 One of the tips I read from another baker who also used a long covered clay baker was to grease both the top and bottom of the baker in preparation for baking. The other baker greased only the bottom of her baker and had difficulty getting the loaf out because it rose and stuck to the top. Lesson learned. After the baking pan is ready, I turned the dough out onto a floured rolling mat and began to work in the nuts and apples. The best way I have found to do this is to pat the dough flat. I spread some of the nuts and apples on one half of the dough, then folded the dough over and pressed down to flatten the dough again. I repeat this process until I have incorporated all of the nuts and apples. Once I have gotten the nuts and apples in using the fold and press method, I knead the dough just a bit in order to work the nuts and apples a bit more thoroughly throughout the dough. Not too much, just a few minutes. Okay, the dough is complete and its time to shape the loaf for the second rise. 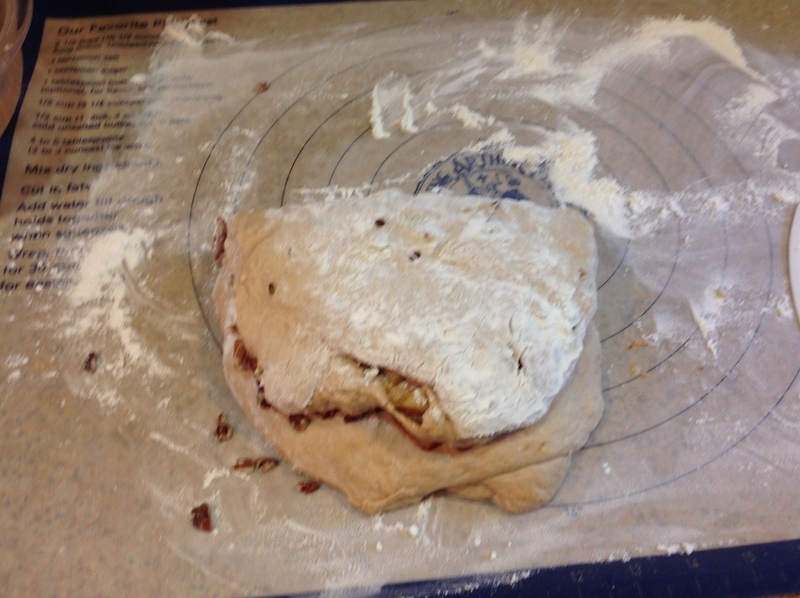 Gently pat the dough out in a rectangle about 12 inches long and roll it up to shape a long loaf. Place the seam side of the loaf down in the bottom of the clay baker. Cover the loaf and let it rise for two hours. You can see from the pics at right how much the dough rose in two hours. The dough will not double in volume but as you can see, it is visibly puffed. Place the lid on the baker and put it in a cold oven. Turn on the oven, set it to 425 degrees and bake the loaf, covered for 45 minutes. After 45 minutes, the lid to the baker is removed to allow the bread crust to brown a little more. My house smells wonderful! All apple and cinnamon. The bread bakes for an additional 15 minutes or so. You will know the bread is done when it's internal temperature reaches 205 degrees. I use a Thermapen instant read thermometer to check the temperature of the loaf. The Thermapen is one of my very favorite baking tools. I never bake bread without it. When the bread is done, turn it out of the baker onto a rack to cool. I waited for the bread to cool before cutting a slice for a taste. Excellent! It is subtly sweet with a pronounced apple flavor. Just look at all the apple chunks! This bread toasts up beautifully and really sings with a smear of butter. Are you ready for a delightfully different yeast bread? If so, give roasted apple bread a try.